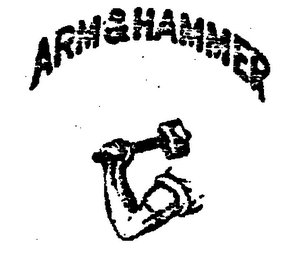 It’s Labor Day weekend — what better time to talk about that great symbol of militant labor and refrigerator deodorizing, the ARM & HAMMER? I have in the past wondered about a given trademark and found, to my surprise, that as well known as it was, the trademark story itself had gotten scant attention. This was certainly the case regarding the now-defunct trademark, BATES STAMP. Not so, however, regarding the Hammer. 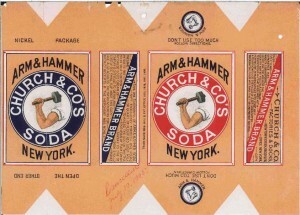 [T]he Arm and Hammer symbol does not originate with the Church family business, but rather has been widely used by others for other purposes. Traditionally, the Arm and Hammer image symbolizes manufacturing or industry, as for example on Wisconsin’s Coat of Arms and State Flag. In Lewisburg, Ohio in 1932, an Arm and Hammer rubber stamp was used to cancel postage (www.stuartkatz.com/fancycovers3.htm), the symbol presumably employed here in its reference to manufacturing or industry. To approach closer to the point, the symbol was also adopted by the American Socialist Labor Party, a precursor of the American Communist Party. Why should Socialists or Communists have been drawn to the arm and hammer? One imagines primarily because of its association with labor; however, the image may also carry a suggestion of militancy, of a powerful arm able to smash opposition. When you think of ARM & HAMMER™ Baking Soda, you think of our little yellow box. That box has a lot of history – and the high quality it represents is appreciated by a new generation. For more than 165 years, people have chosen pure, versatile, effective, environmentally safe and economical ARM & HAMMER™ Baking Soda for baking and countless household & personal care uses. Today, consumers appreciate that ARM & HAMMER™ Baking Soda is an effective, yet gentle cleaner and a real alternative to using harsh chemicals, which makes it great for use around food, kids, and pets. It can also be used to replace other household and personal items that may have ingredients that are harmful to the environment. For more than 165 years, Church & Dwight Co., Inc., the makers of ARM & HAMMER™ Baking Soda, have been a fixture in your home. Our yellow box is so familiar and our logo is one of the most trusted trademarks. Follow our Timeline to see how ARM & HAMMER™ Baking Soda, and our company, has developed over the years. True dat. But not de whole true. A link to an ASP “timeline” on the website … timed out. But the site’s “history” link really dances around what would seem to be a pretty obviously intriguing story. 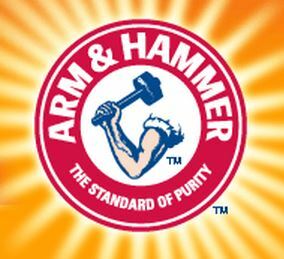 ARM & HAMMER BAKING SODA The muscular arm and raised hammer represent Vulcan, Roman mythological god of fire and metalworking, and was once the symbol of the Vulcan Spice Mill in Brooklyn, N.Y. James A. Church, owner of the firm, took the symbol with him when he shut down the mill in 1867 and went into business with his father, a baking soda manufacturer. Shortly afterwards, the “power” behind Vulcan’s arm and hammer became the trademark of Church’s baking soda, which had the “force” to make bread dough rise. Ah, Vulcan! See, right off the bat we’re going counterintuitive here, because I would have thought that if there’s a bread angle on the hammer, it refers to the milling process by which grains are pounded, as if by Vulcan’s hammer, into fine flour for making fine bread. That presumably is why they named the mill the Vulcan Spice Mill, because do care if your spices are ground very fine, whereas you don’t really have much interest in “forcing” spices to rise — which all the hammering in the world won’t do. But who am I to question Wallechinsky & Wallace? We can only hypothesize why Church, Patterson, or anyone else decided to use the arm & hammer emblem as a commercial logo at this time. First, it was an established icon that would be easily remembered. As a symbol of the national labor movement, the arm & hammer still retained the positive connotations of integrity and strength derived from the Vulcan myth. This is also the exact time that the seeds of the union label movement were being planted across the country in San Francisco, starting with the Carpenter’s 8 Hour lumber stamp (1869) and the Cigar Maker’s “white men” label (1874). These labels were meant give consumers an economic way to support labor, and to a way to differentiate higher quality union made goods from those produced in sweatshops and other unsanitary conditions. 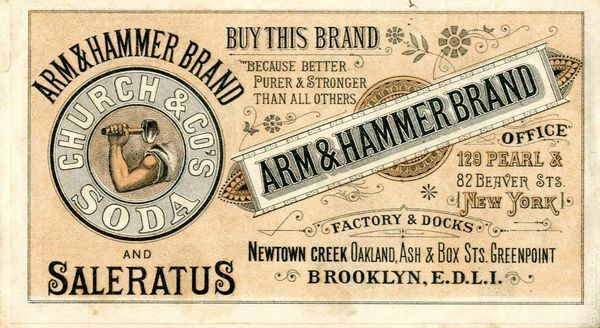 It may be possible that consumers were prepared for the concept of the union label because they had already started to see and trust products that used “honest labor,” the arm & hammer emblem or other variations on this theme as a selling point. Aside from all this, Church and Dwight specifically had another logical reason to continue to use a representation of the god of fire as their logo; fire has traditionally been understood as a symbol of purification. Obviously, purity is important when your product is a fine white powder, but this was also the birth of a new marketing trend . . . Purity and cleanliness have always been key concepts in the marketing of the Arm & Hammer brand. Consumers could purchase a sealed box of Arm & Hammer baking soda and assume it was clean and manufactured in a sanitary environment. In later years Church and Dwight added the motto “the standard of purity” to their trademark. This approach — the general association of the symbol with “honest” (i.e., pure) labor — could explain why the Church & Dwight official story is so quiet about the symbol’s origin. Unionism and even manual labor have much different associations and resonances in modern times compared to in 1905. On the other hand, Munson acknowledges that she’s speculating. I kind of like my simple version: The mill was called “Vulcan” because it pounded the hell out of whatever was being milled. Nothing makes a good meal like good meal from a good mill! And that muscular arm and hammer grinds that message home. Now, things got a little complicated when a capitalist-roader friend of Comrade Lenin by the name of Armand Hammer, whom you might remember from before he, like Lenin’s paradise, met his eternal reward, gets into the story. 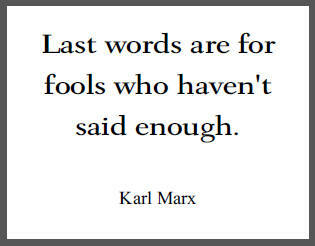 If indeed Lenin said, “The Capitalist will sell us the Rope that we will hang them with,” that Capital-C Capitalist was surely none other than Red-Diaper Baby Armand Hammer. The “Gore” web page really drills down on this, but Hammer’s hypocritical relationship with both Capital and Communism is old news to us old Cold Warriors — if you want the truth about it, in fact, just ask Pravda. My father named me Armand after Armand Duval, the romantic hero in Dumas’s La Dame aux Camélias, or so he said. 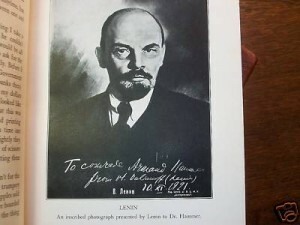 It is fairly obvious that he must also have had in mind the symbol of the Socialist Labor Party – an arm and a hammer. I have had more fun out of the constant confusion of my name with the baking soda which is sold all over America… As a joke, I had designed an ensign with an arm and a hammer for my yacht. Whenever the yacht would appear in American waters, people would come up to me saying, “Ah, you must be the baking soda king.” . . . Nothing worse for diluting baking soda — or a baking soda brand — than a gazillionaire commie plowing the waters with your logo on his yacht, you’d think. In fact, as is widely known, Hammer did end up buying an interest in Dwight & Church just because of the name thing and even sat on the board of the holding company… yada yada yada. What’s with the “TM” in the logo used on the official website? Don’t get excited; this is not another BATES STAMP situation. The ARM & HAMMER registered mark is alive and well — indeed, a lot of them are. A whole bunch, for all kinds of things. This valuable trademark has, notwithstanding the commie-yachtsman’s adventures in liberating the logo from the running dogs of baking-soda imperialism, been managed just fine. Except for the website, which should, in fact — as a matter of basic trademark hygiene — feature the hammer-like circle-R, not the mixing-spoon-like “TM” symbol. The most likely explanation for the omission is that the logo, in the form shown, i.e., superimposed on a white sunburst effect against a yellow-gold field, was only registered last April (serial number 86006064). The graphic should have been updated; the fact is, however, the usage shown is entirely silly anyway. For one thing, while that registration, of which among other things color is a feature, is as fresh as a new box of you-know-what, there have been registrations for the ARM & HAMMER logo itself for a while. A very long while. For example, there’s a 1905 registration (serial number 71000365) for a mark that may or may not be, as a matter of trademark law, the same as our beloved logo (at left). That registration’s TSDR history is kind of interesting, in fact, because it appears to represent a successful effort by the company to ease its way toward a more and more modern version of the mark, over time, toward the one we recognize today, as demonstrated by these other specimens filed in connection with renewals and other PTO business indicate. It seems meritorious: While the black and white drawing shown at left is the official registration image, the colorful version at right, filed with the PTO eighty years later is, apparently, a bona fide specimen of the what the mark looked like on the product packaging — which is pretty much the mark as we recognize it today. My point is, the circle-R could and should have been used on the website graphic as soon as it was put up, especially because the position of the “TM” shown in the middle of the yellow-gold field that is actually part of the mark described by PTO registration serial number 86006064, would not make sense in the middle of the mark itself. If you wanted to use the TM symbol as a placeholder for the new color-and-design mark, soon to be switched out for a ®, you’d place that outside the mark, i.e., the yellow-gold square. In fact, where the TM is now makes perfect sense for the ®! Because the ARM & HAMMER logo in the middle is, in fact, and has been over 90 years, a registered trademark (even though there’s another little “TM” inside the blue circle too!). While there may be all sorts of good branding sense in launching a color-based version with its own registration, that should not come at the expense of a proud and appropriate assertion of the registered rights in the original, symbol of resistance-crushing proletarian power. And, of course, of baking powder: an entirely appropriate substance to find at the intersection of socialism, capitalism and… bread.